A large percentage of everything you have in your home was most likely shipped over water and at some point, was processed at a harbour. The person responsible for the smooth operation at these ports is the Harbour Master. 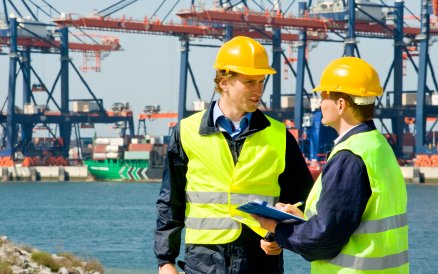 The simplest way to describe their role is that they oversee the daily operations of a cargo port. However, this does not do justice to the depth and variety of work that they do. The Harbour Master has the ultimate authority for granting permission for ships to come and go in the port. In order to carry out this important task, the Harbour Master has to become familiar with every aspect of the port including all security guidelines, nautical data, and environmental concerns. This puts them at the center of all operational planning for the port. Although a large portion of the Harbour Master’s job would be considered administrative work, they will often spend time down on the docks. This is especially true when weather conditions are an issue. It’s also very common for a Harbour Master to work extended hours when traffic at the port is at its peak. The specific duties of the Harbour Master depend on the size of the port. With a smaller facility, the Harbour Master could actually be the sole employee. This would put them in a hands-on role managing vessel movements. At a larger port, the Harbour Master will work with various management systems to coordinate all the port activities. They need to make sure all the tugs and pilots are up to code and following proper procedures for their specific duties. The Harbour Master is also responsible for maintaining all the safety protocols and managing the pollution and emission controls of the port. There are thousands of commercial ports all around the globe. Each one of them needs a Harbour Master, which means you could work anywhere in the world. It is vital that you understand the international port regulations of the region you would be working in, and learning the culture will be helpful for creating good working relationships with local employees. There is a lot of competition to secure a job working as a Harbour Master. Often, a Harbour Master will begin their career with a stint at sea and typically, the person who lands the job will stay in that position for several years. You’ll frequently notice that Harbour Masters have made the transition from ship captain to their current position. Officially, holding the title of master mariner is not required; however, most Harbour Masters have obtained that level of instruction and experience. The good news is that there are many new ports being built that will require the services of a certified Harbour Master. The International Harbour Masters’ Association is the leading online resource for Harbour Masters around the world. Their online mission statement reads, “With 200 members in 40 countries the Association strives to bring together all those who hold a managerial position in aspects of the control of Marine Operations within a port.” The association provides current information about all harbour regulations. There are links to training facilities, job posts, and nautical information that would be of benefit to anyone in the profession. If you are interested in this type of career visit www.harbourmaster.org to learn more.